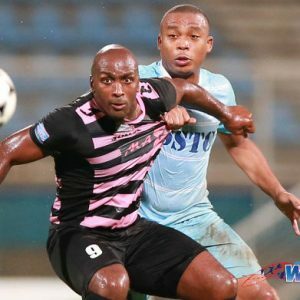 Two-time defending Pro League champions Central FC got their truncated 2016/17 league campaign off to the perfect start last night with a 2-1 victory over bitter Couva rivals DIRECTV W Connection at the Hasely Crawford Stadium in Port of Spain. 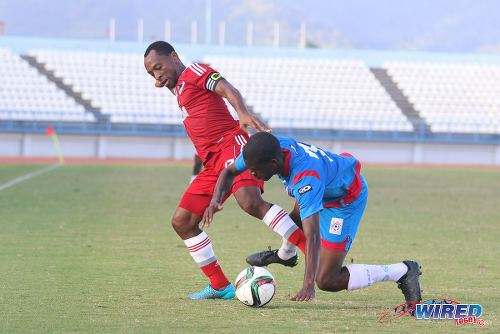 The “Couva Sharks”, who are also the current Caribbean Club champions, left it very late, as former skipper Leston Paul clinched the winner with a left-footed shot past goalkeeper Terrence Lewis in the third and final minute of stoppage time. It was a bitter pill to swallow for Connection, who mustered an 84th minute equaliser from Grenada striker Jamal Charles but still ended with nothing to show for their efforts against their fiercest foes. Photo: Central FC attacker Jason Marcano (centre) goes for goal during 2016/17 Pro League action against W Connection at the Hasely Crawford Stadium in Port of Spain on 4 October 2016. Looking on are Connection players Briel Thomas (left) and Maurice Ford. There were no late twists in the earlier encounter between the new-look Ma Pau Stars—formerly North East Stars—and Police FC, as the law enforcers thoroughly thumped their opposition by a 5-1 margin. Prior to kick off, former Trinidad and Tobago internationals and Jason Scotland and Carlos Edwards were the ones making the headlines. But, once referee Gyasi McDonald blew the first whistle, Police tricksters Christon Thomas and Kareem Freitas were the ones causing havoc. Stars took the lead through a clinical 12th minute item by Jerrel Britto, against the run of play, but that pushed the Lawmen into action. With Britto operating on the left wing and offering little support for his fullback Hakim Baird, Police attacked constantly and vociferously down the right flank. And lanky Police striker Jameel Perry ought to have had a hat-trick within the first 15 minutes, as he failed to capitalise on some slick wide play by Freitas. The Richard Hood-coached Police outfit were not kept at bay for long though, as giant skipper Todd Ryan scored two goals in the space of three minutes to penalise a sloppy Stars defence. First, the bulldozing central midfielder pounded a close range shot into the back of the net after a miscued defensive clearance from a corner in the 22nd minute. Then Ryan expertly slotted a penalty past custodian Glenroy Samuel after Perry was brought down by a rash Glenton Wolffe tackle, just moments later. There was joy for Perry too, as he swept home a low, right side cross by the lively Freitas in the 38th minute. Ma Pau may have had the star names in their lineup but everything was aligned for Police last night. Edwards and Scotland, both of whom were members of Trinidad and Tobago’s World Cup squad in 2006, were largely ineffective for the duration of the 90 minutes. Scotland replaced the injured Kerry Baptiste in the 19th minute, while the versatile Edwards played at right back from the onset. The 37-year-old Scotland, known is his heyday for his power and shooting ability, was inexplicably shy in front of goal on the night, as he passed off a few presentable scoring opportunities in the second period. Police were not that passive, though, and a clinical 49th minute strike by Thomas, coupled with a late poacher’s item by substitute Keion Wilson completed the polished ‘Police operation’. 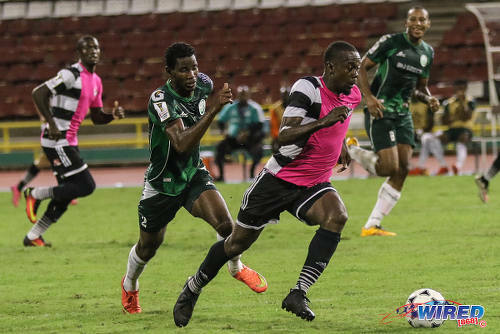 In last night’s marquee fixture, which has now been dubbed the “Couva Clásico”, the Sharks came out circling their prey very early. Photo: Central FC attacker Marcus Joseph (right) tries to pull away from W Connection winger Kurt Frederick during 2016/17 Pro League action at the Hasely Crawford Stadium in Port of Spain on 4 October 2016. Central coach Dale Saunders adopts a pressing style as often as possible and Paul and Nathaniel “Spanish” Garcia did exactly that in the middle of the park. 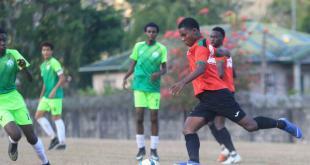 Connection, who started with St Lucia international left back Kurt Frederick in central midfield and playmaker Hughtun Hector on the left flank, were pegged back by Central’s hurrying and swift ball movement in the opening stages. 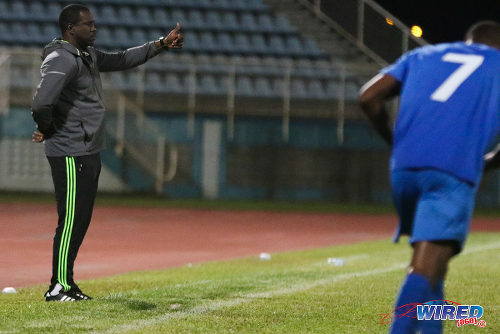 Connection coach Stuart Charles-Fevrier reverted Frederick and Hector to their regular positions around the 20 minute mark, as the two Couva-based clubs—both already eliminated from the 2016/17 CONCACAF Champions League—scrapped for space in an increasingly tight game. Central’s attacking pair of Johan Peltier and Marcus “Lobo” Joseph formed an intriguing combination on one end while Connection’s Malik St Prix was more than a handful in his lone striking role at the other. The game’s first goal would come from the defending champions in the 41st minute, as Lobo skilfully left defender Alvin Jones on his backside before squaring for Darren “Chucky” Mitchell to finish with a sweet right-footed shot. Not too shabby for the versatile new Central captain, who who was playing at left-back. Charles-Fevrier made more adjustments to his initial setup upon the resumption, as Kevon Goddard and the tricky Aikim Andrews replaced St Prix and Anslem Jackson. Photo: W Connection defender Alvin Jones (left) cracks a free kick towards goal during 2016/17 Pro League action against Central FC at the Hasely Crawford Stadium in Port of Spain on 4 October 2016. Andrews, who earned his solitary National Senior Team cap against Nicaragua in friendly action last year, injected some life into the “Savonetta Boys” with his direct play down the left. However, he and his teammates were restricted to long range efforts as Central worked overtime to nullify their threat in behind the defence. Andrews was gifted a glorious chance in the 65th minute though, as goalkeeper Javon Sample sent an errant pass into his path. But Andrews, harried by a retreating Garcia, could not find space to shoot and conceded possession with a heavy pass. Central seemed to be in full control but were finally undone in the 84th minute, as veterans Hector and Andre Toussaint played some head tennis on the edge of the area before Charles struck with a looping header past Sample to equalise. Suddenly, Connection looked good for a point or more. But one Mr Paul had other ideas. In the final minute of stoppage time, the feisty midfielder picked up the ball from deep and ran at the retreating Savonetta Boys. It was almost as though the Connection defenders were daring Paul to shoot, and shoot he did! His clinical left-footed shot flew past the outstretched Lewis from the edge of the area, and Connection were bitten at the death. 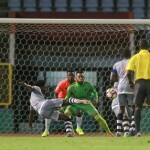 Photo: W Connection goalkeeper Terrence Clarke complains to his defence after conceding during 2016/17 Pro League action against Central FC at the Hasely Crawford Stadium in Port of Spain on 4 October 2016. Central FC (4-3-3): 1.Javon Sample (GK); 5.Keston George, 4.Andre Ettienne, 3.Keion Goodridge, 11.Darren Mitchell (captain); 19.Nathaniel Garcia, 6.Leston Paul, 8.Sean De Silva; 7.Jason Marcano, 99.Marcus Joseph, 17.Johan Peltier (10.Keron Cummings 66). Unused Substitutes: 30.Akel Clarke (GK), 2.Glenn Sutton, 15.Kaydion Gabriel, 24.Kevon Villaroel, 26.Jem Gordon. W Connection (4-2-3-1): 1.Terrence Lewis (GK); 12.Anslem Jackson (23.Kevon Goddard 46), 4.Maurice Ford, 16.Alvin Jones, 27.Jelani Peters; 8.Briel Thomas, 2.Kurt Frederick; 11.Neil Benjamin Jr (20.Jamal Charles 69), 14.Andre Toussaint, 13.Hughtun Hector; 43.Malik St Prix (17.Aikim Andrews 46). Unused Substitutes: 33.Aquelius Sylvester (GK), 21.Ronell Paul, 28.Mickell Charles, 37.Daniel Diaz. Photo: Central FC midfielder Leston Paul (left) holds off St Ann’s Rangers defender Sedale McLean during TT Pro League action on 20 February 2016. *—First 48 minutes of match was played on Friday before power outage stopped play. Central FC 2 (Darren Mitchell 41, Leston Paul 90+3), W Connection 1 (Jamal Charles 84) at Hasely Crawford Stadium. Central uniform is horrifying wtf !! Lol. It’s the most popular uniform we’ve had. Sold a dozen to people in USA and Canada alone. For some reason, while the numbers on the jersey are clear, they don’t stand out from a distance. Malik Johnson I must admit, I was really unsure when we first chose it. Being exposed to Champions League and global TV, we wanted to stand out. Even if people just commented on the shocking uniforms! It contains our club colors – black and white to keep with tradition. But I have been surprised by the positive response. The players love it to! As they say – Dare to be Different! Well there is cause and effect ….if its getting the exposure you were seeking then its done its job ….. doh let divas like me sway you any differently …besides … I’ve seen Parlermo and Juve rock a pink kit to good effect!! Kevin Harrison HOW FANS QUITE IN vanCOUVER HAVE T-SHIRTS!!! BUT FANS RIGHT IN COUVA DONT HAVE ANY!!!!! The prisons steuupps. Them really good yes. And yuh see why ah does call them bootleg referee eh, the numbers on the prison jerseys backs eh suppose to be visible and they were allowed to play with them eh W- Connection shudda protest and won the game instead steeuuppss. Them really good yes. Who the arse designed Central FC’s gear? They like prisoners who support breast cancer week. We didn’t attend but so said the Pro League. Yes.